When you think of classic animation, Walt Disney Studios is inevitably the first company that pops into your mind with Warner Brothers and their famous Looney Tunes characters perhaps being a close second. However, Paramount Studios was also in on the act, backing the Miami Florida based Fleischer Studios where Max and Dave Fleischer created such beloved characters as Betty Boop, Superman and Popeye. With more than 45 major animation patent techniques to their name-- it was Fleischer Studios that became the first animation house to perfect the art of rotoscoping, which involved “tracing over the movements of a live actor,” which they did for the titular character of their first feature-length animated work, Gulliver's Travels. Loosely based on the Lilliput segment of Jonathan Swift's classic eighteenth century political satirical novel, this 77 minute classic work -- only the second feature-length animated film ever produced in America – received two Academy Award nominations for best original score and best original song respectively. On the surface, the movie seems extremely similar to the Disney mold and one with its emphasis on overly rounded characters, cutesy songs, and romantic sentiment which appeared to be-- as some critics argued-- the Fleischer Studios cinematic response to the challenging gauntlet thrown down by Walt Disney after Snow White and the Seven Dwarfs. Although from a storytelling point of view, it doesn't hold viewers’ attention nearly as well as Disney’s Snow White and the simplistic plot-line that makes Gulliver merely a supporting character (bearing little in common with Swift’s book) is terribly unsuccessful-- the animation and cinematic quality manages to marvel even by today's standards. 70 years after its initial premiere and incidentally arriving on Blu-ray and DVD right around the same time as original Fleischer studio rivals’ Walt Disney's own 70th anniversary release of their film Pinocchio, Gulliver’s Travels pales in comparison with the story of the wooden boy and Jiminy Cricket yet it's important to note just how much attention Fleischer Studios paid to camera placement, camera trickery, and cinematic process. Highly cinematic and incredibly visual right from the start as the sailor Gulliver finds himself shipwrecked on the land of Lilliput where the tiny inhabitants literally if in palm of his hand, I was extremely impressed by some of the vaudevillian/silent comedy style humorous sight gags and the inventive way the Fleischers and their co-directors employed techniques utilized by tying ears like D.W. Griffith, Buster Keaton and others such as in a great sequence filmed underneath a bridge as we hear the sounds of boots stomping overhead with the lights from each of their lanterns illuminating the cracks between the wooden boards. It's these curious choices to film something that could have been done in the most standard and/or obvious of ways that elevates what is admittedly kind of the weak film plot-wise into a must-see for film scholars and devotees of animation. Hitting the high-definition format of Blu-ray for the first time ever-- while upon first glance it doesn't seem to make the most technologically superior advantage of the format in a quality that seemed only a fraction above that of DVD-- the clarity is a vast improvement to most work from the era. Originally requiring a two year commitment of over 600 of Fleischer Studios’ best artists in their effort which utilize 39,000 pencils 12 tons of pains in the creation of more than 639,000 celluloid and 115,000 composite scenes—in addition to of course rotoscoping Gulliver himself—the 1939 film has been given the state of the art frame by frame makeover. With a fierce dedication to use historically accurate Technicolor palettes to color correct the work to its original display via “a long-lost 35mm source print,” that was transferred to a 16x9 widescreen aspect ratio (“without stretching or losing any image beyond standard vertical safe areas…[enabling] more picture it to be visible on the left and right sides of the frame than ever before”), Gulliver’s original soundtrack was also completely restored and viewers are given the option to listen to either that version, an “enhanced stereo” option or testing out the brand new Dolby Digital 5.1 track. It also boasts some irresistible classic original songs that have since become popular standards including, “All’s Well,” “It’s a Hap-Ha-Happy Day,” and the Oscar-nominated “Faithful Forever” in the feature film that now sound better than eve. 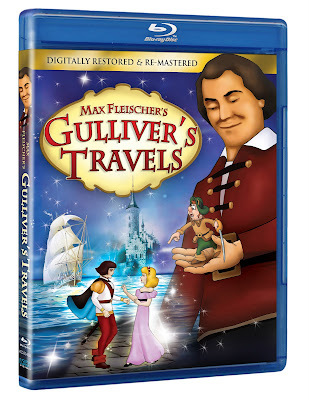 And the brand new E1 Entertainment release of Max Fleischer’s Gulliver’s Travels additionally packs in Gabby animated shorts “Swing Cleaning” and “King for a Day,” (which were derived from outtakes left on the film’s cutting room floor) along with a super cool and retro six minute “The Making of a Cartoon,” Fleischer Studios documentary that takes you step-by-step through the process from hand-sketching to painting on celluloid until it’s ready for the camera in the world of Popeye. Although you may have trouble trying to set toddlers and younger children in front of the slow-moving film, this uneven but painterly breathtaking historical classic is nonetheless worth a look and is perhaps best suited to the “older kids” in all of us to at least broaden our knowledge on the history of American animation. Not to mention its extremely important subtextual lesson included in the film as you watch Gulliver and are hit with the realization that—despite their mastery of it and aside from the fact that now every studio is giving them a run for their money—Walt Disney’s legendary classics weren’t the only American cartoons breaking technologically new ground from the 1930s and beyond.